Welcome to Target Tag 2019, agents! This is the thread for the HITMAN 2 edition of @Euler13’s innovative assassination contest (special thanks to him for letting me bring this back for round 2) inspired by @David47’s Player-Made Elusive Contracts (PS4) thread. Target Tag is an assassination challenge that everybody can take part in. The aim of the game is to kill the tagged target in the most unique and creative way possible. 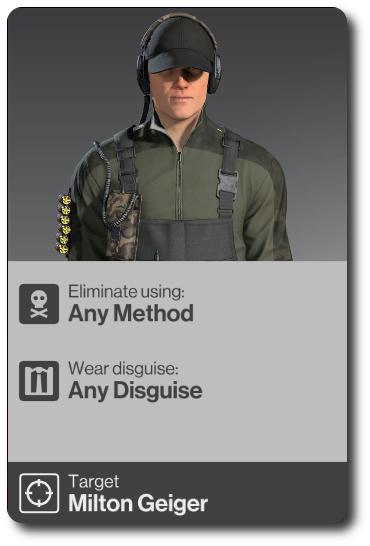 As such, Silent Assassin is not required. Anything goes! Members vote on their favourite kills at the end of each target cycle, so try to make your run as entertaining as you can if you want to take the top spot. The rules will be a bit different to last time, so have a look through them, whether you’re a new player or a Target Tag veteran, if you want the best chance at taking the gold. The competition will run on a weekly cycle. Any time between Sunday, 6pm GMT and Monday, 6pm GMT, a new target will arrive in town. If the previous winner fails to mark a target within this time window, the runner-up must post their contract. Once the target has been marked, you will have until Friday, 7pm GMT to start planning your kill. You have as many chances as you want to take them out, so don’t feel rushed! Your goal is to be as inventive as possible with the target. Silent Assassin is not necessary. Between Friday, 7pm GMT and Saturday, 7pm GMT, the thread will be open for submissions. Only video submissions posted within the allowed window will be counted. This is so that voting is fair and all submissions are in the same format. Between Saturday, 7pm GMT and Sunday, 6pm GMT, voting will be open. Vote for whichever submission is your favourite. Is it a flawless SA run? Did it teach you a new trick? Did it make you laugh, surprise you, or inspire you to try it for yourself? These are all things that make a good submission, so take that into account when you vote. All voting will be anonymous. Contracts posted by the winner must be single-target contracts, with no complications and no kill conditions. Main targets cannot be tagged. Aside from these rules, any target is fair game; try to pick a target with lots of killing potential to keep it fun for everyone that takes part. Please make Snowballs unique with ONE more feature! This looks really fun. Looking forward to this. Hm… So it’s like a “kill the target in the most extragavant way” contest? Target #1, Amelia Garros (the jogger), is now in Whittleton Creek. No submissions accepted until 7pm GMT on Friday. Good luck to everyone giving this a go! Okay then, I’m not the most creative player in terms of kills so this’ll be a new kind of challenge for me. Good question. Edited is totally fine as long as it’s pure gameplay. Reminder that submissions will be open 3 days from now. If you’re planning on participating, now might be a good time to start considering how you’re gonna pull this off. Entries are now open for until tomorrow at 7pm GMT! @immadummee47 that was fukin brilliant. Seriously made my day!